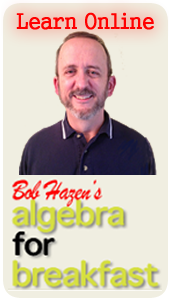 Why Algebra for young kids? • Because Algebra focuses on the general, while Arithmetic focuses on the particulars. Both are needed. Each provides insight to the other. But kids are already overloaded with the many particulars of Arithmetic – they can benefit from seeing and learning about the big picture generalities of Algebra. • Because with Arithmetic, kids often lose sight of the forest because the focus is on all the many trees. • Because the Algebra focus on the forest shows how similar trees are related to each other. • Because the Algebra focus on the forest shows how apparently very un-similar trees are also related to each other. • Because kids can learn both Algebra and Arithmetic at the same time. • Because the teaching of Arithmetic is too often rule driven, rather than concept driven. This means that many kids up through 5th-6th grades can memorize all the rules without really understanding what they’re doing – and then they hit a wall with the many new concepts in Algebra. • Because how many times have you heard an adult say, “I was good at math through 6th grade, until I got to Algebra…”?